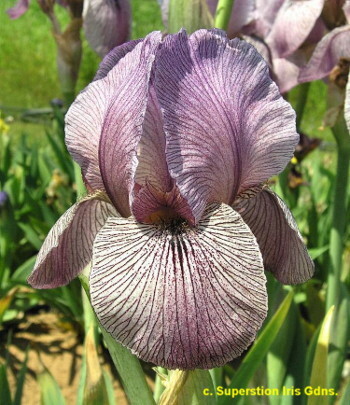 'Alakazam' (Richard Tasco, R. 2013) Seedling 07-AB-52-07. AB (OGB), 36 (91 cm). Midseason bloom. Standards light pink-lavender ground, veined darker pink-violet; style arms light maize, pink-violet midrib, pink crest, veined darker; Falls light parchment-lavender heavily veined dark burgundy all over to the edge, signal very diffuse and small, veined dark burgundy; beards gold-bronze in middle and throat, burgundy end, sparse and insignificant; medium purple based foliage; regelia form. 05-AB-10-14: ( 'Energizer' x 'Desert Embroidery') X 'Desert Embroidery'. Superstition 2013.